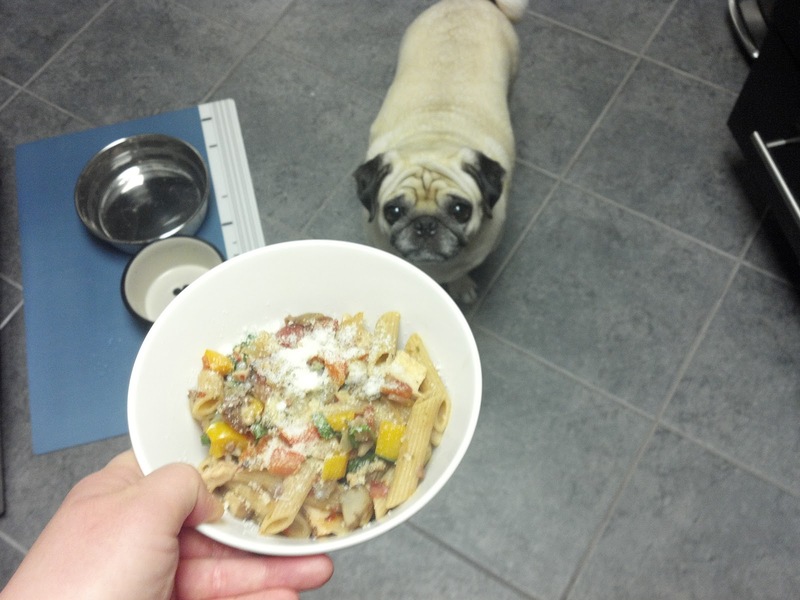 Lil Smug Pug: Pasta Puttanesca! 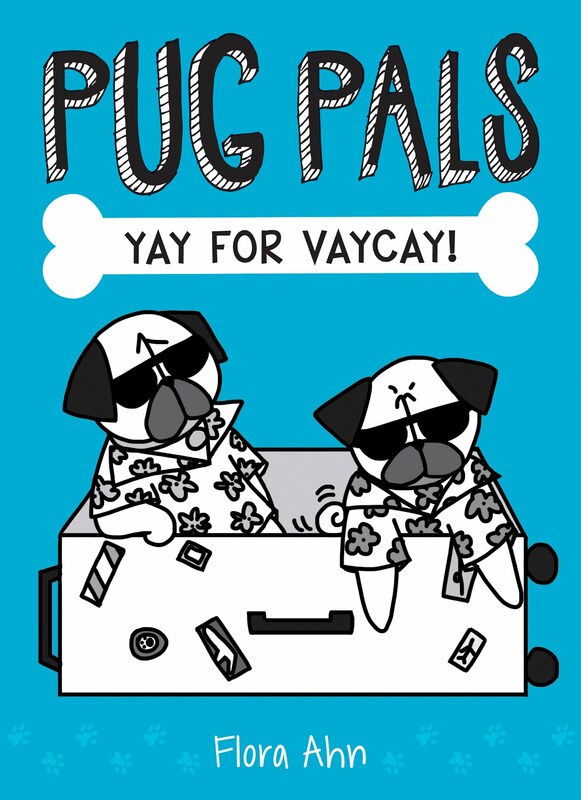 Dinner is served my lil pug! Tonight I made pasta puttanesca starting with a recipe from MyRecipes and it was delicious! I had a crappyish day at work and got home late and was tempted to just order food for dinner but I had already prechopped all of my ingredients for this dish and I've been trying to order food less and cook more. So I cooked, and I'm glad that I did! 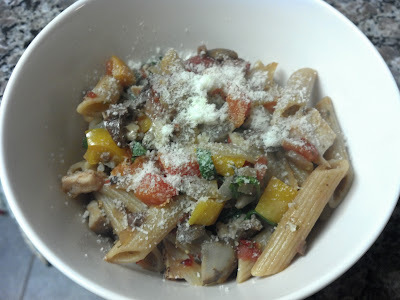 I followed the recipe for the most part, but I added chopped bell peppers, onions, and mushrooms since I love those and add them to all pasta dishes. 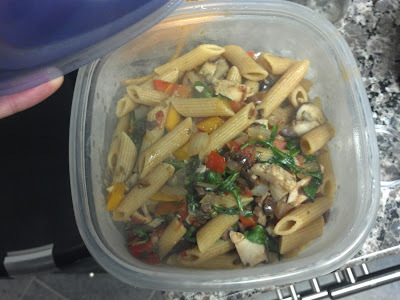 I also added some grilled chicken (just nuked some Trader Joe's just grilled chicken - so awesome, but wish it was cheaper) for extra protein, and the leftover arugula I had from my last pasta dish. And I always add more red pepper flakes and ground black pepper. Sorry, the grated parmesan cheese kinda obscures the pasta but there's no way I'm eating pasta without some form of cheese. As if. 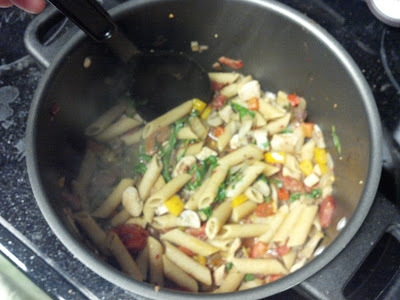 So here's a picture of some of the leftover pasta in the pot so you can see what the pasta looked like better. At this point I'd already scooped up half of it and put it in a tupperware for another meal and spooned my first bowlful (I can never have just one serving). See, here it is in the tupperware! My first bite tasted a bit fishy but I didn't notice it after the second, or third, or fourth, etc. Although I think I probably should've cooked the anchovies a bit longer and really gotten it to dissolve better. But I didn't mind much since I love sardines. I highly recommend this pasta dish and it's great because you can personalize it with things you like! Like I added extra kalamata olives and a ton of capers (love those!) and all those other ingredients I mentioned above. Oh and I used penne because I wanted to finish the bag I had but I think this would be amazing with other noodles. Lastly, this is a fairly salty dish with the olives, capers, and anchovies, which was perfect for me since I am a salt fiend, but for those who don't like salty dishes you may want to rinse the olives and capers off before chopping them. P.S. I also wanted to mention watch out when you put those anchovies in the pan! With the olive oil (I used the Trader Joe's spray) and garlic already in there, as soon as those oily anchovies hit the pan things were sparking and crackling everywhere! I'm dreading having to clean my stovetop now. Ugh. Snow/Ice and My First Poached Egg! 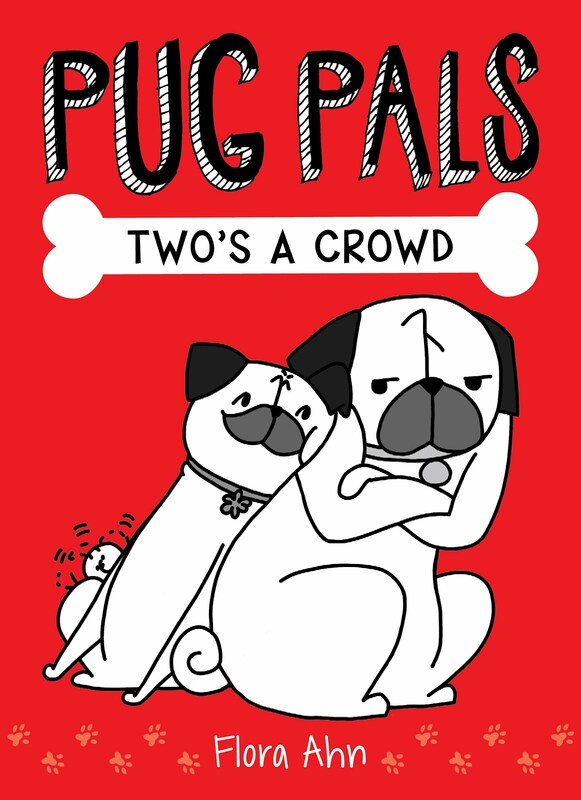 Food and Pug - What More Could I Ask For?